It’s a tradition at our house. The first tomatoes are eaten out-of-hand, standing in the garden while the fruit is still warm from the sun. The honor this year went to the Juliet, which began producing its egg-sized tomatoes a week ago. The next step, after a large tomato ripens, is a BLT built with thick slices of tomato. This season’s BLT debut featured the Sioux varietal, which we bought for sentimental reasons — our native South Dakota being home to the Sioux tribes. DeBaggio’s promised sweet, tangy, 6-ounce orbs – and that’s exactly what we got. The BLT was actually a BBT – I substituted big broad leaves of Genoa basil (can’t go wrong with basil and tomato, after all!) for the lettuce. 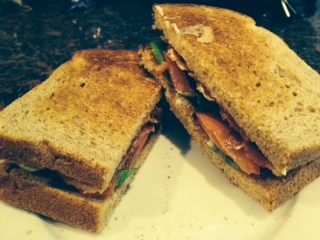 I lacquered wheat toast with mayo, followed by stacks of basil, tomato slices and bacon slabs. Messy … and a heavenly taste of summer.